The finds also raise questions about the possible place of Neanderthals in modern human ancestry. Details of the discoveries appear in the US journal Proceedings of the National Academy of Sciences. The human bones were first identified at the Pestera Muierii (Cave of the Old Woman) cave in 1952, but have now been reassessed. Only a handful of modern human remains older than 28,000 years old are known from Europe. Erik Trinkaus from Washington University in St Louis and colleagues obtained radiocarbon dates directly from the fossils and analysed their anatomical form. The results showed that the fossils were 30,000 years old and had the diagnostic features of modern humans (Homo sapiens). But Professor Trinkaus and his colleagues argue, controversially, that the bones also display features that were characteristic of our evolutionary cousins, the Neanderthals (Homo neanderthalensis). Neanderthals appear in the European fossil record about 400,000 years ago. At their peak, these squat, physically powerful hunters dominated a wide range, spanning Britain and Iberia in the west to Israel in the south and Uzbekistan in the east. Modern humans are thought to have entered Europe about 40,000 years ago, and within 10,000 years, the Neanderthals had largely disappeared from the continent. By 24,000 years ago, the last survivors vanished from their refuge in the Iberian Peninsula. While many researchers think Neanderthals were simply driven to extinction - either by climate change or competition with the moderns - a handful of scientists believe they interbred with the incomers and contributed to the modern human gene pool. Professor Trinkaus and his co-researchers point to several anatomical features of the Romanian bones that are either primitive-looking or characteristic of Neanderthals. These include a large "occipital bun", a bump or bulge at the back of the skull, as well as other features of the lower jaw and shoulder blade. "These data reinforce the mosaic nature of these early modern Europeans and the complex dynamics of human reproductive patterns when modern humans dispersed westward across Europe," Professor Trinkaus and his colleagues wrote in Proceedings of the National Academy of Sciences. "Strict population replacement of the Neanderthals is no longer tenable." Dr Katerina Harvati, a palaeoanthropologist from the Max Planck Institute for Evolutionary Anthropology in Leipzig, Germany, said the finds would further the understanding of early moderns in Europe. She added that some traits in the fossils were either "archaic", which means they were characteristic of the ancestors both of modern humans and Neanderthals, or that their evolution, presence and absence in modern humans was poorly understood. "Both the author's description and the few photographs provided in the article show a multitude of derived modern human traits and an overwhelmingly modern morphology of the described remains," she explained. Professor Clive Gamble, from Royal Holloway in London, UK, said the discoveries would yield valuable information about early modern humans in Europe; but he was cautious about the evidence for interbreeding with Neanderthals. "We've known for some time that the earliest modern humans in Europe are a funny-looking bunch. They are a distinctive looking lot - very heavily built, particularly in the skulls," he told the BBC. "The question is whether these robust features show that they were up to no good with Neanderthal women behind boulders on the tundra, or whether they were just a very rugged population. "I think, really, the only way to tell would be to look at their ancient DNA. When DNA was extracted from the classic Neanderthal skeleton, the last ancestor between modern humans and Neanderthals turned out to have lived 600,000 years ago." Similar claims have also surrounded early human skulls from Mladec in the Czech Republic and the skeleton of a male child unearthed in 1998 at the Abrigo do Lagar Velho rockshelter in Portugal. 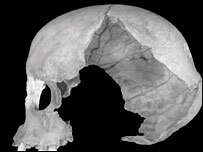 The Lagar Velho boy, who died about 25,000 years ago, has been described as a "hybrid", with a mixture of modern and Neanderthal features.